There is a long history of a spring-time gathering here at Cornell University. While this event has taken many shapes over the past century, one common thread persists: celebration. Today, the event we affectionately call “Slope Day” inherits a proud century long tradition as a year-end gathering and celebration of the Cornell Community. The first recorded “Spring Day” takes place. Spring Day was a celebration of the end of winter and imminent warm weather. This tradition continued for the next half century. Over the years, Spring Day was comprised of events ranging from variety shows to circuses. One year there was a mock bullfight; another year students, staff, faculty and guests enjoyed the Fraternity Float parade. While many of these events took place at and were centered around the University’s open spaces (including Libe Slope), there were many activities that took place indoors, as well as off campus. Protests and unrest plagued the University. There was little time and place for any celebration during these years. In addition to nationwide protests and civic discord, many minimum legal drinking age restrictions were lifted. During this time many states began lowering their minimum legal drinking age (MLDA) from their post-prohibition high of twenty one. Cornell Dining sponsored a barbeque on Libe Slope on the last day of classes and Spring Fest was born. This so-known “Great Feast” started in the afternoon, and was centered on a big chicken barbeque and live music. New York State’s MLDA of eighteen made it possible for alcohol to be served at Spring Fest, as most Cornell students were over eighteen by the end of the school year. The federal government passed the National Minimum Drinking Age Act in 1984, mandating that all states had two years to increase their MLDA to 21 or lose Federal-aid highway funding. New York changed their MLDA because of this act, and so the university’s alcohol policy was changed to reflect the change in state law. Robert Cray band performed at Spring Fest, sponsored by the Cornell Concert Commission. Spring Fest was cancelled! After too many students admitted to Gannett the year before, the university decided to not hire a musical act. In the face of these legal changes and the public sentiment that precipitated it, it was no longer feasible for the university to allow the event. Students formed the Springfest Coordinating Committee to promote safe drinking habits and to provide alcohol-free activities as an alternative to drinking. Slope Day, as it came to be called, became an informal gathering of students on university property. During that time, the focus of Slope Day shifted from food, music and celebration to widespread and uncontrolled alcohol consumption. An organization, known as SOS, was created in order for students, staff, and faculty to provide a “positive presence” on Slope Day. Now known as the Slope Day Volunteer Committee, these volunteers operate as a subcommittee of the Slope Day Programming Board, and fulfill vital roles in the event from working to ensure the safety of those attending, to manning the gates, fence, and checkpoints, distributing water, and keeping the Slope clean. Without student and staff volunteers in their brightly colored t-shirts, Slope Day couldn’t happen! Student opinion surrounding the future of the event began to shift, as evidenced by the creation of SlopeFest, a non-alcoholic activity-based event featuring carnival-type games and rides, live music, free giveaways, and other attractions. SlopeFest, taking place on West Campus, was meant to accompany Slope Day and accommodate students during times when they weren’t drinking as well as provide an alcohol-free environment for students desiring one. Hunter R. Rawlings III, then president of Cornell University, issued a charge to the President’s Council on Alcohol and Other Drugs to assemble a group of staff, faculty and students to critically assess and address the role that alcohol and other drugs (AOD) played on Slope Day. This group became known as the Slope Day Steering Committee. The Steering Committee began to undertake corrective measures to address the alcohol related issues surrounding Slope Day, including moving the concert back onto the slope. A new and improved Slope Day was created by a Steering Committee of students, faculty, and staff. Live entertainment (Rusted Root and Fat Joe) brought to the Slope, catered food and alcohol service from Cornell Dining, and giveaways became a part of the celebration as well. A student-administration partnership was created, one where students would take the lead in planning and organizing programming and direction for the day. The Slope Day Programming Board was created and funded by the Student Assembly to organize the event and bring bigger and better entertainment to the day. The celebration continued, with performances by Kanye West and OAR, the return of SlopeFest, and record crowds in attendance. The Slope Day Programming Board brought The Starting Line, The Game and Snoop Dogg. The bands played for record crowds and Slope Day was a huge success! Once again, Slope Day was a lot of fun for all, featuring Ben Folds and Talib Kweli with special guest Acceptance. SlopeFest was moved from West Campus to Ho Plaza. T.I. with special guests TV on the Radio and Catch 22 took the stage and slope by storm. New additions to SlopeFest made it a larger hit than ever before. Prizes were raffled off to winners of certain carnival games before the music began. Gym Class Heroes brought local flair to the Slope with energetic openers Ted Leo and the Pharmacists and Hot Hot Heat. Even the rain could not keep students from celebrating the end of the semester. Libe slope became greener with Cornell Dining’s switch to biodegradable products (including corn plastic cups). The Pussycat Dolls took command of the stage as the first all-female act for Slope Day. Openers the Apples in Stereo and Asher Roth pumped the crowds for the main act as neither the threat of rain nor recession could prevent this Slope Day from being enjoyed by the huge audience that attended. In the Campus Consciousness Tour, Drake headlined with a message of sustainability to a welcoming crowd. The audience was warmed up by the beautiful weather and by openers Francis and the Lights and k-os. 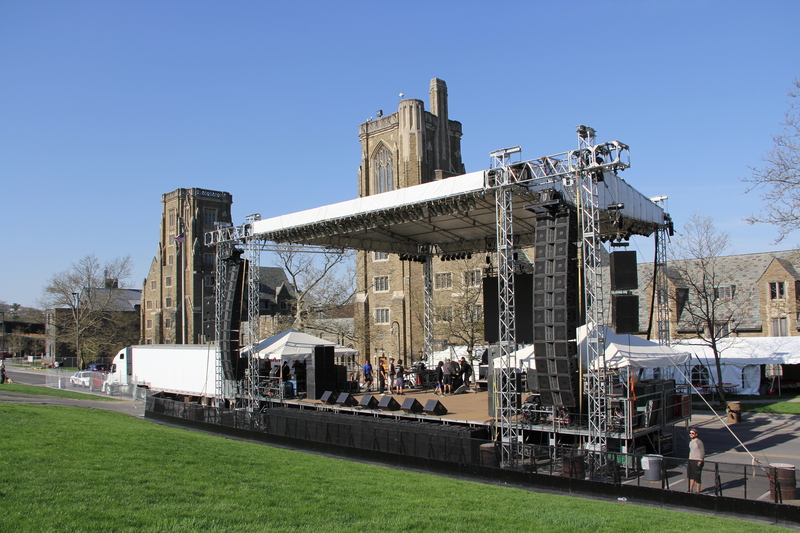 In 2011, Grammy Award winning hip-hop artist Nelly made sure Slope Day wasn’t just a dream for Cornellians. Excellent weather and openers Ra Ra Riot and The Cool Kids brought everyone out to the Slope early to spend time with friends and celebrate the end of another great year. In 2012, international star Taio Cruz lit up the Slope like it was dynamite. Supporting artists Neon Trees and The Wailers brought record early crowds out to enjoy the perfect weather and celebrate with the Cornell community. In 2013, Hip-hop artist Kendrick Lamar headlined Slope Day. Supporting artists included DJ 5 & A Dime and Hoodie Allen. In 2014, Ludacris headlined Slope Day with performances by Matt and Kim and 3Lau. In 2015, Slope Day was headlined by Chance the Rapper with supporting performances by artists Salva and Magic! In 2016, Cash Cash and Walk The Moon took the stage, supported by R-City. Misterwives and Big Gigantic performed at Slope Day in 2017, supported by Brasstracks + S’Natra. Galantis, Young Bombs, and Dreezy rocked Slope Day 2018.